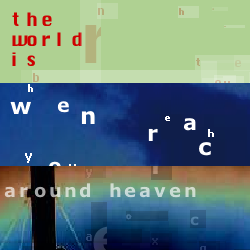 This set of three works provides three different and powerful combinations of text, sound, image, and exploded letters, all of which function to cut up and recombine language using code developed for Concatenation. In Concatenation, the machine of the text assembles poems that deal with the ability of language to enact violence; in When You Reach Kyoto, the text and images engage the city and computation; and in Semtexts, combinations work at the level of syllable and letter. Author description: These works of generative poetry use potential combinations of many algorithms to create an unpredictable poetic "performance piece." Moving the mouse may result in other types of change. Users need only click to create a new iteration of these poems. Instructions: To hear the sound, turn on the computer's speakers or plug in headphones. Click to generate new poems or cut up the text. WARNING: Shockwave 10 is required. In user testing for the Electronic Literature Collection Volume One, Semtexts has crashed some current browers with the Shockwave plugin installed. Previous publication: Generative Poetry has been published by Machine Poetics, http://machinepoetics.com, as well as at geniwate's site, http://www.idaspoetics.com.au.